Interests - Cake baking/decorating, computer, going out cinema/theatre with sisters, musicals, theme parks, concerts, seeing animals especially reptiles, shopping. Ayesha was diagnosed with a rare auto-immune disorder called Wegener’s Granulomatosis in October/November 2008 after 3 years of being misdiagnosed with severe asthma. This disease is quite rare and she is quite a rare case. She has had chemotherapy and high dose steroids to treat it and it now seems to be in remission. However she has permanent lung damage and a very low lung function from when the disease was active. She still has maintenance chemotherapy and steroids to keep the disease in remission. However she still has a lot of problems with her lungs and she requires a high flow of oxygen 24/7 and a type of ventilator overnight. She uses a wheelchair when out. Currently we have been refused a lung transplant due to the rarity of her underlying disease and it not having been performed before in Wegener’s. However, she been to see a specialist in her condition and the lung transplant team at Great Ormond street. The specialist seems to think it may be worth the risk to try and transplant and has asked Newcastle transplant team to consider if they will asses her now since he believes the underlying condition is in remission and will not return post transplant which is a main worry. So as it stands we are waiting to hear from the lung transplant boss at Newcastle for his views. I received the call for transplant on the 13th of February at 12.26 am and went to theatre at 6.25 am. I was in ITU for 4 days and am now on the regular transplant ward. I’m moving in the right direction with some good days and some bad, but overall improving. I think it is time to move on from Post Pals now as I feel someone else may benefit from the service more. I hope that is okay and thank you for all the support. I had a very quick admission to hospital for only a few days, which was really good considering I was very sick when I went in! Also, I’m due to have a portacath inserted ASAP. I have started 6th form which is a lot of hard work. I am taking Biology, Chemistry, Physics and Maths A-levels. I have fallen back a fair bit already and hope to catch up soon! Thanks to whoever sent Sadiya an animal card game from Amazon and the Wii game. Hi sorry for not updating in a while. I have some fab news though – I got listed for transplant on the 23rd of July! Things have been fairly stable and I’ve been spending lots of quality time with my sisters over the summer holidays. We have been to Center Parcs and Flamingo Land which was a lot of fun. I also got my GCSE results and I did very well with grades between A* and B. I’m going onto A-levels and hope I get my transplant soon so I can go to sixth form more. I also have my driving test in a few days time!! It been a fairly settled month and things with the transplant are slowly moving forward (there are just a few more tests to be done). Apart from that it has been a quiet month. Thank you for all the birthday cards for Ayesha and Fatimah and thanks for all the birthday gifts too! Everything is just the same this month and I am waiting for transplant assessment which is this month! So hopefully I should have some news soon! Thank you for the world book day books! Hello, December was both a good and bad month. I was in hospital until Christmas Eve and had quiet a nasty hospital admission causing me to end up in intensive care for a few days. However, this lead to my transplant assessment here at Newcastle being brought forward, so the ball is now rolling and I saw the transplant consultant in clinic on the 4th of January. There are still some tests to be done to rule out some further complication that could occur due to my underlying condition, so at the moment I am home again. I had a wonderful Christmas at home and a lovely New Year. I would like to thank everyone for all the cards and gifts and thank you to the elves. 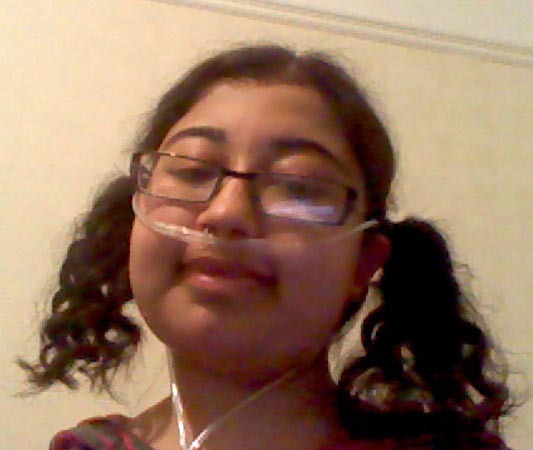 Ayesha is in hospital at the moment and is quiet poorly with her bad lungs. She received some presents my mum took in for her today though and that cheered her up – I think the card said from Milly and Alice! The last month has been pretty good as I’ve been stable and out of hospital. I managed to get to a Jonas Brothers concert too and meet them – it was fabulous!! Also, yesterday I was at a Brave Hearts Awards ceremony and I won a bravery award!! Thanks to Post Pals for the gumball machine – they have nearly all gone!! I have been doing okay over the past month. I did catch swine flu but thankfully it wasn’t very bad and I was only in hospital for a day. I thought if I caught it I would be very ill because of my low immune system. Apart from that all has been well and I am enjoying receiving cards and postcards in the post. Thanks everyone for the post.